(November 2010) The building has a Scandinavian touch without a doubt. Perhaps that is a result of the interaction between stave church roof-construction, implementation of Nordic building materials and rustic construction. The Scandianvian Golf Club is situated within a 25 km radius of Copenhagen not far from Farum. Designing architects were Henning Larsen, at home in Denmark’s Capital City. 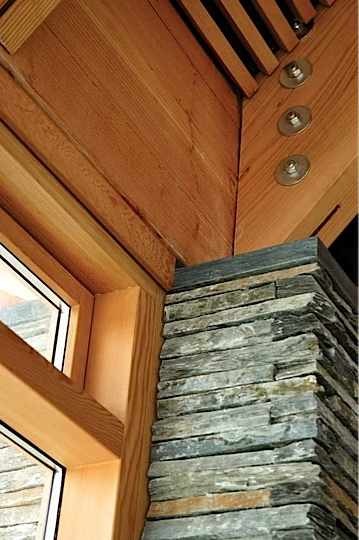 Outwardly, slate sets the accent and was used for the roofing as is common in the North. The slate was won locally from the Otta area. The stone’s distinguishing characteristic is its iron oxide veins, lending a golden touch. More on that subject later. The building’s rustic character is also defined by the pillars on the building’s window front, the conspicuous chimney and finally the surrounding walls. Refuse from the slate quarries in trimming slate slabs was used for these features as well as for parts of the interior. Using these chips in various thicknesses, craftsmen put together the puzzle which later clad the carrying concrete wall. The beholder is unwittingly reminded of dry stone walls. But the colour blending of the various materials also lends an interesting touch. The slate-grey contrasts with the golden yellow of the Oregon pine. Conversely, the golden veins in the stone appear closely related to the wood. When the sun shines through the windows, the beholder’s view falls from a large rustic room to golden scenery of the 2 x 18-hole golf course including a great deal of wilderness. The wooden interior was awarded the 2009 Award of the Copenhagen Carpenters’ Guild.